GENEVA--(BUSINESS WIRE)-- Columbia Sportswear has announced a three-year extension of its partnership between the Columbia brand and the Ultra-Trail du Mont-Blanc (UTMB®). The extension solidifies Columbia’s commitment to trail running and its close relationship with the UTMB, the pinnacle global trail running event. 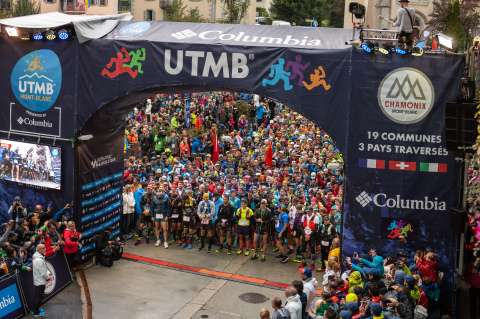 Columbia will remain the UTMB’s presenting partner and official outfitter for the apparel and footwear categories. In that capacity, Columbia will equip runners with a participant T-shirt, and for those able to complete the grueling race, Columbia will design and supply the much-coveted finishers’ vest. Columbia will also outfit members of the race organization, volunteers and official guests. Over the past 16 years, the UTMB has expanded far beyond its home base in Chamonix, France to become an internationally revered trail running event. The UTMB links communities with passionate trail runners and leads participants through three countries – France, Italy, and Switzerland – where it reaches tens of thousands of local spectators and millions of international fans via live webcast and multistage updates on the premier trail runners in the world. Columbia’s engagement with the UTMB has proven to be a substantial success for both parties over the last four years. The event will continue to serve as a launching pad and a testing ground for the Columbia Montrail trail running line of footwear, apparel, and equipment, designed for aspiring and professional trail running athletes. At this year’s UTMB, Columbia fielded a global team of more than 50 Columbia Montrail athletes from around the world, including TDS® winner Marcin Swierc from Poland. Columbia is committed to working closely with these elite athletes through their training and competition, utilizing their incredible insights to ensure Columbia Montrail products meet their exacting standards on the trail.